1. Preheat the oven to 180°C (350°F) Gas 4. To make the rosti, place the grated pumpkin and potato in a large bowl. Add the chillies and the fresh coriander, and season. Squeeze the mixture in a clean dish towel to remove excess water, then divide it into four patties and squeeze them between your palms to make firm patties. 2. Heat the oil in a frying pan over medium heat. Fry the patties on both sides for 3 minutes or until golden. Transfer to a baking sheet and put in the oven for 15 minutes or until cooked through. Place the spinach in a pan and wilt over medium heat for 30 seconds. Blend using a food processor or blender to make a coarse purée, adding the salt and ½ tablespoon of the oil. Set aside. 3. Put the tofu slices in a shallow bowl and sprinkle over a little of the remaining oil and half the mustard and cumin seeds. Let marinate for 20–30 minutes. Heat the rest of the oil in a separate frying pan. Fry the tofu slices in batches until golden brown. Drain on paper towels and keep warm. 4. Heat 2 tablespoons of the oil in a pan over medium heat and gently fry the onion for 5 minutes until softened and lightly coloured. Add the rest of the mustard and cumin seeds and fry for a few minutes. Add the chillies, ginger and garlic, and cook for 2–3 minutes. Add the garam masala and cook for 1 minute, then add the spinach purée and the tomatoes and cook for 3–4 minutes. 5. Put the tamarind glaze ingredients in a pan with a little water over high heat. Reduce by two-thirds. Strain. 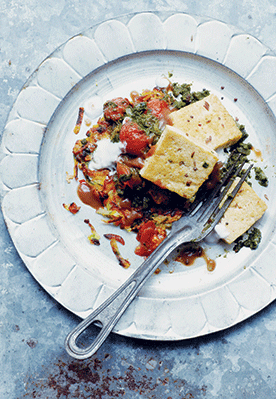 To serve, place a rosti on a plate, then add some spinach masala and several pieces of fried tofu. Drizzle with tamarind glaze and coconut cream.